A MASSIVE THANK YOU TO ALL OF YOU WHO BRAVED THE WEATHER AND POPPED IN TO SEE US ON SATURDAY FOR OUR OPEN DAY DESPITE THE THUNDER, LIGHTENING AND RAIN!! 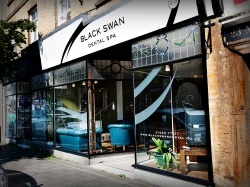 EVERYONE WHO CAME COMMENTED ABOUT HOW NICE THE PRACTICE IS AND QUITE A FEW DECIDED TO BECOME NEW PATIENTS OF BLACK SWAN DENTAL SPA AND WE ARE LOOKING FORWARD TO THIER FIRST APPOINTMENTS WITH US. DONT FORGET THAT ITS THE LAST DAY TO COMPLETE OUR COMPETITION ENTRY FORM FOR THE FREE TOOTH WHITENING KIT. THE WINNER WILL BE ANNOUNCED AT THE END OF THE DAY TODAY (18TH FEBRUARY 2013), SO IF YOU HAVE ANY FRIENDS WHO MIGHT BE INTERESTED IN TOOTH WHITENING direct THEM TO OUR WEBSITE FOR THIER CHANCE TO WIN!